She enters the room with an arthritic limp, a crutch under an arm. The huge red bindi on her brow crinkles as she strains to lower herself into a chair, smoothing the folds of her nine-yard sari so typical of the attire of rural Maharashtra. Behind her a dozen children troop in, their chores and games temporarily forgotten in the excitement of a guest's arrival at Sanmati Bal Niketan, a two-flat home for orphans at the Pune suburb Hadapsar. They surround their Mai. "I am Sindhu Sapkal," Mai announces. Another time, another place. The voice, quietly commanding, carries through the breeze across an open maidan in Somurdi, a remote village of Purandhar tehsil in Pune. Sindhu is addressing a crowd, the men sit hunched in front while their women listen from open doorways. Sindhu, 52, quotes poet-saints Tukaram, Namdeo, Bahinabai and Gadgebaba as she speaks of her causeÑbringing up destitute children at five institutions she has set up in Maharashtra. She asks them for donations. The response is immediate. Sindhu's sari pallu rapidly fills up with coins and currency notes. The village sarpanch promises a quintal of rice to her ashram, the Mamata Bal Sadan, at Kumbharvalan, home to 70 children. A shop owner offers 10 packets of glucose biscuits. As dusk falls, Sindhu packs up for her move on the morrow to Satara district, where a meeting with gramsevaks has been scheduled. Deepak Gaikwad, the first child she took under her wing in the 1980s, is accompanying her. In his thirties now, Deepak has taken over charge of Mamata Bal Sadan from his Mai. Mai set up the sadan on a piece of land Deepak inherited from an uncle. Donating the land, Deepak "told me that had I not taken care of him, he would have been nowhere," says Sindhu. It was the second home she built. Like Deepak, many of the nearly 200 children Sindhu has taken care of are now grown men and women, who stand on their own feet. Again like Deepak, most of them support their Mai in her work. Uttam Yevale, 27, who grew up at Mai's ashram at Chikhaldara at Amravati district, is a college teacher in Ahmednagar. "She is like my mother. In fact, she is my mother," he says. The days he is free from work, Uttam potters around Sindhu's Gangadharbaba Chhatralaya at Guha, which houses 45 children. It is a bungalow on 10 acres all donated by former Bombay High Court judge B.G. 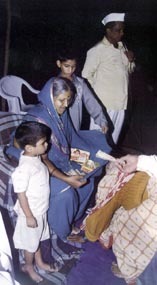 Kolse Patil in 1997. Though he wasn't an orphan, Patil had grown up in a home for destitutes. "It is totally selfless work," he says. "She is a living example of what a woman can do." Prakash Sapkal, 24, who grew up in the Chikhaldara ashram, heads the Chhatralaya. The history graduate took up the work after failing to get a government job. "Maybe I will not get money, but all my needs are taken care of," he says. "Besides I am proud of contributing to Mai's work." The first one to be proud of Sindhu Sapkal was her father, Abhiman Sathe, an illiterate cowherd in Pimpri, who was keen to educate her, much against his wife's wishes. So every day on the pretext of sending her out to graze the cattle, he would pack her off to the village school. "There was no money to buy a slate," recalls Sindhu, who was then known as Chindhibai. "I practised the alphabet on thick, palm-sized leaves of the bharadi tree, using its thorns to write." Marriage at the age of 10 put an end to the fourth standard student's education. The groom, Shrihari Sapkal, alias Harbaji, was 30. "I was told there are only two processions in a woman's life. Once when she gets married and the other when she dies. Imagine my state of mind when they took me in procession to my husband's home in Navargaon forest in Wardha," says Sindhu. In course of time, she bore three sons. Today, she feels they were born out of the coercive consummation of her marriage. Sindhu created a sensation in Navargaon in 1972 when she demanded that the forest department pay the village women for the cow dung they collected. The department used to auction the dung to landlords and pocket the cash. "We won the fight," says Sindhu. The taste of success was sweet, but it broke up her family. She claims that an annoyed landlord, Damdaji Asatkar, spread the rumour that the child she was carrying was his. "My husband decided to abandon me," says Sindhu. She was beaten up and dumped in a cow shed, where her daughter, Mamata, was born. "It was October 14, 1973," Sindhu intones. "I cut the umbilical cord with a sharp-edged stone lying nearby." She later sought shelter at her parental home, but "my mother told me to get lost. 'Go and die on the railway line,' she said." Sindhu wandered from town to town, singing and begging near temples. In Faijpur, Jalgaon district, she left Mamata in the care of a temple priest's family while she moved around singing bhajans. "Those were the days of soul-searching. I began feeling I must do something for those suffering like me." The idea was just taking root when she found herself in Chikhaldara. A section of the Melghat jungles on the border of Maharashtra and Madhya Pradesh had been earmarked for a tiger project. It meant people from 84 villages would have to be evacuated. "I reached there on a very dramatic day," says Sindhu. A project officer impounded 132 cows of the Adivasi villagers of Koha. "For three days he did not free them; one cow died. The Adivasis stood looking at their cows helplessly. That day I decided to take up their cause." 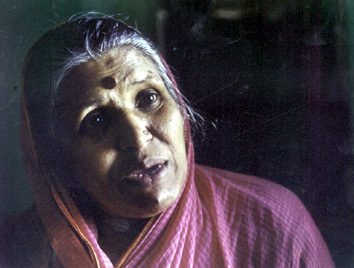 Sindhu fought for the rehabilitation of the 84 villages. In the course of her agitation, she met Chhedilal Gupta, the then minister of forests. He agreed that the villagers ought not to be displaced before the government had made appropriate arrangements at alternative sites. When Prime Minister Indira Gandhi arrived to inaugurate the tiger project, Sindhu showed her photographs of an Adivasi who had lost his eyes to a wild bear. "I told her that the forest department paid compensation if a cow or a hen was killed by a wild animal, so why not a human being? She immediately ordered compensation." That made people look upon her with admiration. 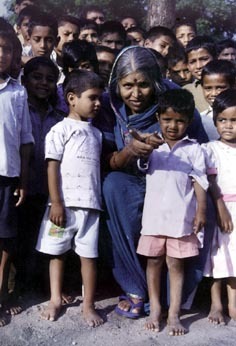 Soon she realised the plight of orphaned and abandoned Adivasi children. Initially, looking after them was a source of livelihood. It didn't take long for it to become the mission of her life. Beginning with her first ashram at Chikhaldara, which she says was "a creation of necessity", she went on to set up five homes, her work taking on a momentum of its own. Abhiman Bal Bhavan in Wardha district, for instance, came about when in recognition of her work, her husband's relatives in Wardha felicitated her. A home for destitute women, the Nadarmai Mahila Adhar Kendra, functions out of the same building that houses orphans at Chikhaldara. Her homes survive on donations and grants, and she unabashedly begs village after village to put whatever they can into a cloth she spreads out on a table after her speech. At the Krantijyot Savitribai Phule Hostel for girls at Chikhaldara, 42 of the 50 inmates receive a grant of Rs 335 a month. "We bear the other girls' expenses," says Sindhu's son Arun Sapkal, who heads the institution and is a co-opted BJP municipal councillor. With money from Arun's curio business and money sent by Sindhu, the inmates get by. Oh God, teach us how to laugh; but let us not forget that we had also cried once upon a time.' The words are etched on the wall behind Sindhu's chair at the Sanmati Bal Niketan. For Mai's children, the sorrow of being abandoned or orphaned gradually fades from memory as they follow the home's regimen. The children are divided into batches which alternately study, work and play. 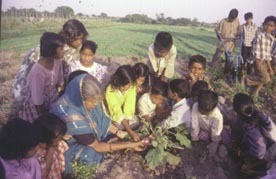 At the Kumbharvalan Ashram, if one group is in the classroom, another will be tending the tomatoes and chillies in the gardens. At the Gangadharbaba ashram, the kids even grow wheat. The boys and girls are segregated after the 8th standard. While the boys go to Gangadharbaba ashram, the girls are sent to the girls' hostel at Chikhaldara. There are exceptions. Vishwas Chaphale, 14, stayed on at the Kumbharvalan ashram to help look after the small children, who run to him to get their cuts and bruises bandaged. For a boy who wants to become a doctor, he is starting young. Quite a few people opt to live and work for Mai. Babasaheb Dushing, 35, left his job as a hotel watchman in 1997. After his wife's death he had sent his children to Sindhu. "But then I realised I could not stay away from them," he says. "So I asked Sindhutai if I could come here." Ever since, Dushing has been working at the Kumbharvalan ashram. Some of the destitute women who land up at Mahila Aadhar Kendra are sent as gruhamata (mother of the house) to the children's homes. Kavita Gavand and Lalita Magar are gruhamatas at the Chhatralaya at Guha. While Lalita is a widow, Kavita walked out on her alcoholic and abusive husband. Their children do not stay with them, but at the ashrams in Kumbharvalan and Hadapsar. "It was a deliberate decision to keep the children away," says Deepak Gaikwad. "Most of our children are either orphans or abandoned. What will they feel if some children began staying with their mothers?" Vacation time, however, reunites the kids with their mothers. Although the children are not given in adoption, there have been cases where couples come forward to sponsor them. Udaysinh Mohite Patil and his wife, Swaymprabhadevi, have undertaken the responsibility of educating Pawan, who lives with them in Akluj, Solapur district. "My wife had organised one of Sindhutai's functions in our village some five years ago," says Patil. After Sindhu's talk, Swaymprabhadevi decided that they would contribute by sponsoring a child's education. "He studies here and goes to Sindhutai during vacation," says Patil. The couple have decided to sponsor another child as soon as Pawan completes his studies. 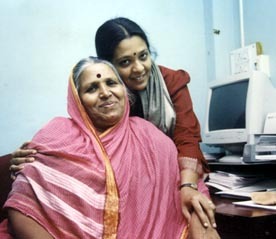 Sindhu's work has won her 48 awards, the most prominent being the Maharashtra government's Savitribai Phule award in 1998. It attracted some controversy, too. Critics claim that Sindhu lobbied for the award and was finally nominated from Buldana district, where she does not even have an ashram. Sindhu pooh-poohs the charge. "Had I lobbied, I would not have argued with them at the award ceremony about the paltry sum of Rs 5,000 they were giving," she argues. "I would have been obliged to accept whatever they gave me and keep my mouth shut." Sindhu's creating a scene, however, worked as the then deputy chief minister Gopinath Munde raised the amount to Rs 11,000. "As regards Buldana district, even today I do not know how the government put me there," she says. "I never claimed that I worked there." However, no amount of controversy can detract from the achievements of a woman who at one time lived on alms. So inspiring has her life been that the Karnataka government included a chapter from her autobiography Mee Vanvasi, released in 1988, in its Marathi textbook for 10th standard students. Today Sindhu proudly states that she has 36 daughters-in-law and 177 sons-in-law. Most of her children are well placed in life. Sham Randive is a lecturer in history at Mhasvad in Satara district. Seema Kokare is an Ayurvedic doctor and settled in Aurangabad. The list goes on. But at 52, Sindhu says she still has plenty more to accomplish. "Let me tell you I am not Devaki who gave birth to Lord Krishna, I am just trying to be a perfect Yashoda." How did you begin social work? I first went to Chikhaldara begging for bhakri (bajra roti) in 1975. Unable to feed myself and my two-year-old daughter, I had almost decided to commit suicide. I was standing under a tree when suddenly its stem caught my attention; I noticed that it had been badly axed, but it was still giving me shade. I almost screamed, 'No I will not die'. I decided to take care of the orphaned children of Adivasis. It is common among them for a man to desert his wife for another woman; the woman then remarries, sometimes abandoning the children. Initially I took care of the children in return for some kutki [a kind of rice], dal and buttermilk. You speak so well at public meetings. When I used to beg at railway stations, initially I would only sing. Later I thought if I started speaking I could earn more. I used to be so hungry. My hunger taught me to speak and the pain within me taught me to sing. I draw inspiration from saints like Sant Gadgebaba, Rashtra Sant Tukdoji Maharaj and Bahinabai Chaudhari. Among the gods, I like Lord Krishna. I don't like Ram, I have an ongoing feud with him because he deserted Sita. I also like Veer Savarkar. Have any children run away from your ashrams? Fortunately not. Even when I convinced people to adopt my children, they did not stay with them, because they call me Mai and know that a mother cannot be replaced. The children have been very cooperative. Whenever I brought home new kids, I told the others they might have to drink dal instead of eating it, since it would be more diluted. But they never complained. Many children are married now. Today I can proudly say I have 36 daughters-in-law and 177 sons-in-law. I have always been more protective of girls. Would you like to return to your husband? I cannot be a wife again. But if my husband comes to me as a child, I will serve him. I am not angry with him, he was not educated, it is not his fault. Had my husband not abandoned me, all this work would not have happened. Sindhu Sapkal's 70-year-old husband, Shrihari, today lives in Malegaon Theka village in Wardha. Still a cowherd who periodically goes into the jungle, he and sons Amrut, Arun and Sanjay left Navargaon forest two years after Sindhu's departure. "Apart from petty marital differences which are there between every husband and wife, there was no dispute between us," says the wrinkled old man who Sindhu claims threw her out of the house in 1973. Shrihari has a different version. "It was a day of great embarrassment for me when she left home," he says. "My community asked me to marry again, but I refused as I had decided to look after the children." He can scarcely connect Sindhu the social worker with the woman who was once his wife. "She was so simple," he says. "She has done so much for others, but could not provide us with a proper shelter," says Shrihari. "Just last year, I constructed this house. I never thought of going to her." Shrihari says Sindhu fell out with local landlord Damdaji Asatkar over a piece of land. "But he did not harass her." Asatkar's son Vinod, who lives in Navargaon, elaborates: "Her father originally belonged to our village, and used to till the forest land. But after he shifted to Pimpri, the forest authorities gave us the land. And when Sindhutai came here after her marriage, she demanded the land back." However, just like the other villagers, Vinod also admires Sindhu, and feels indebted to her and her cow dung agitation. Nanaji Ghode, deputy sarpanch of Navargaon, says: "Today villagers get Rs 1,000 per truck [of cow dung]. We owe it to her." Born in a cow shed in Wardha, Mamata Sapkal studied in three schools in three different districts of Maharashtra in the first five years of her schooling, and completed her graduation courtesy a temple trust in Pune, before opting to take a master's in social work. As Sindhutai's fourth child, she shared her mother's trials and sorrows from the day she was born, and is today in charge of the Sanmati Bal Niketan in Hadapsar near Pune. Unlike her mother, she prefers operating behind the scenes, liaising with the government and individuals for donations. Here she speaks about life with her Mai. As a child, I wasn't fortunate enough to stay with my mother. I remember the hardships she faced to get me admitted to the Seva Sadan High School in Pune, the way she was treated in a house where we happened to stay for a few days, the tears that rolled down her face time and again, the first time she gave me two rupees to buy sweets when I was appearing for my H.Sc examinations, the sleepless nights she spent when I had surgery for appendicitis. These are images from the past which instantly come to my mind when I think of her. But the picture will not be complete without orphans and destitute children she has brought up. Like me, they too belong to her and she is their mother like she is mine. But 25 years ago the situation was different. She was all alone, begging on the streets with her child. She had no shelter, no food, and had to protect herself from the lust and cruelty of society. How she survived! My friends in college always called her 'Mai'. I remember asking her once if she ever felt like studying, having lots of friends and someone to confide in. She listened to me quietly and then said suddenly: "Mamata, if you are talking about the feelings and emotions which one experiences as a youth, I do not even know when it was all over for me. If you are talking just about education, I am fulfilling my desire to study through you, and in you, I have someone to confide in." That was the moment when I felt I had grown up. Since that day our friendship has been gaining strength day by day. 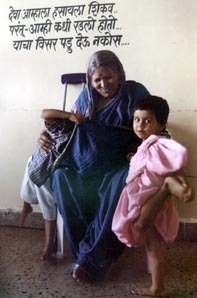 In 1990, mother was in hospital, when father came to see her. There were three people standing in front of me and I did not know which one was my father. Then mother told me he was the man on the right. He spoke to me, asked me to come to Wardha, but added hastily that if I did I should say that I had come on my own and that he had not invited me. I just didn't feel anything. Mother's ability to work is just amazing. She can work tirelessly for 8-10 days at a stretch. There have been times when she has travelled throughout the fortnight, come home for a while and then set out again. She is ever willing to respond to a plea for help from an orphan or a destitute. Whenever I ask her to take some rest, she refuses, saying she cannot afford to till every institution she started becomes self-sufficient. Sometimes I force her to take rest, treat her to her favourite baingan bharta and bhakri (bajra roti). She has been a mother to so many of us. Now I want her to take rest and allow me to be her mother for a while.